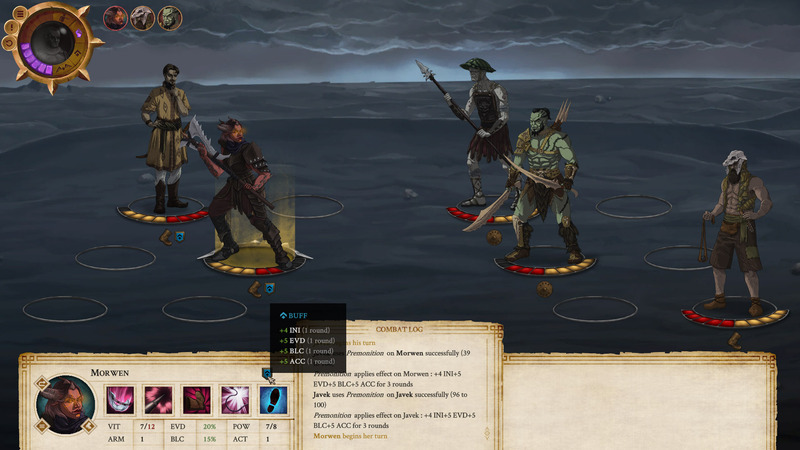 Companion Combat is turn-based, where 1 to 6 enemies fight against your team of 1 to 6 Companions. You can use the Skills of your Companions to defeat your enemies, protect your Companions, and set yourself up in advantageous positions on the combat board. Companion combat is made up of rounds. Each round, all the participants take turns to act, and when everyone has had their turn, the current round ends and a new round is started. This goes on until either all your Companions or all your enemies are defeated. 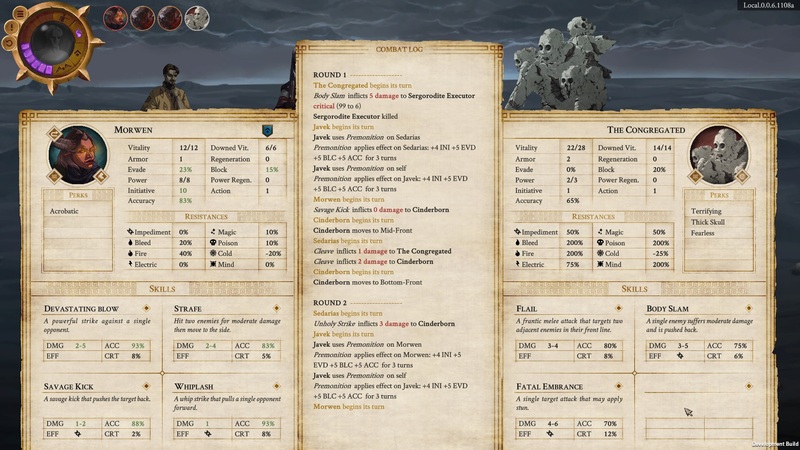 The Combat board is divided into two sides: the friendly side (left), where your Companions and occasional allies are, and the opponent side (right), where your enemies are. Both sides can have a maximum of 6 combatants. Each side has a front row (melee row) and a back row (support row). Each row has 3 positions. Certain skills can only be used when standing in a position of the appropriate row (for example, melee skills can only be used from the melee row). The minimized Character sheet features the basic stats of your active Companion: their set of skill icons and the stats of said skills (more on skills in Part 2!). The Character Sheet can be opened to its full size, where you can see all the combat-relevant stats of the active Companion and consult the tooltips to learn more of each stat. The Combat Log can be consulted at any time to see what exactly occurred. The log can be scrolled but if you wish to see more of it, it can be opened fully. The order in which combatants receive their turns is according to their Initiative (INI): at the beginning of each round all active combatants add 1-6 (random) to their INI to determine in what order they will progress through the round (starting from the highest INI). 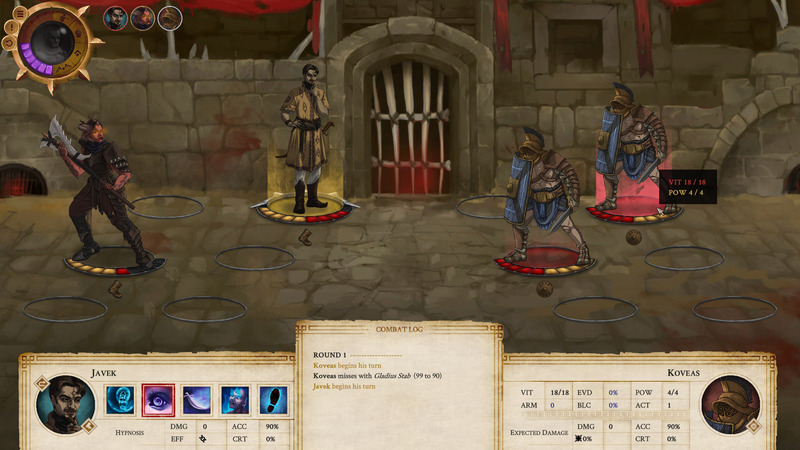 The Initiative order(portraits at top left) shows the order in which combatants receive their turns. Wise leaders use this information to plan ahead. You as a vagrus do not take part in combat directly but you can influence what happens in a very direct way nonetheless. The Leader medallion (top left corner) shows your Resourcefulness (purple bar) and Leadership skills. Each such skill can be unlocked by leveling up your vagrus, and each of these can be used to alter the course of combat using Resourcefulness. For example, Empower can be used to give Power to a Companion so that they can use powerful skills again, or Aid can be used to bring back Downed characters (who are essentially defeated and can’t act in their turn). This brings a whole new strategic level to Companion combat. In the next part of this series, we are going to go into skills and movement rules in Companion combat. Stay tuned!